DENVER—Saying that it was the absolute perfect way to end his Hall of Fame career, Denver Broncos general manager John Elway casually mentioned to Peyton Manning just how great it was to go out on top as a Super Bowl champion in 1998, sources confirmed Friday. “You know, walking off the field for the last time as a world champion was really something else,” said Elway, adding that not much could ever top being hoisted onto his teammates’ shoulders as the last seconds of his career ticked away, not to mention the fact that it is the image most NFL fans will forever associate with him and his legacy. “Obviously, winning one Super Bowl was great, but getting two back-to-back was just incredible. And it felt especially amazing after always coming so close and hearing people say for years that I choked when it really mattered. Oh, and riding off into the sunset as a member of the same team that I played my whole career with? 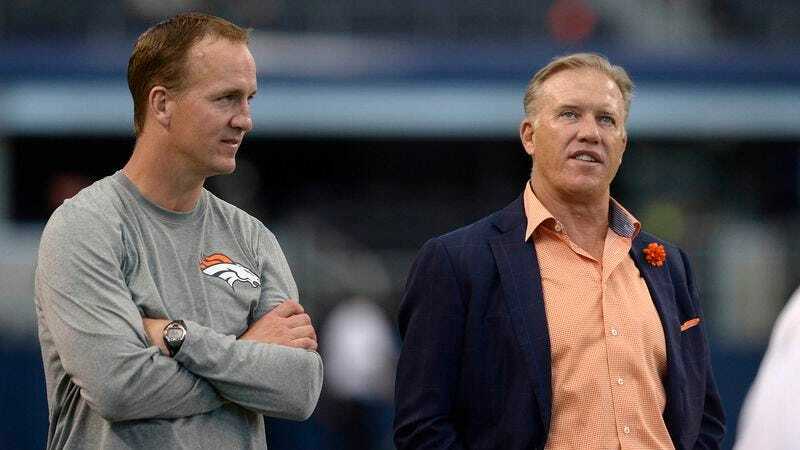 Yeah, I’d definitely say that was pretty special.” Elway reportedly added to Manning that walking away from the game on his own terms with perfect health was equally, if not more satisfying.